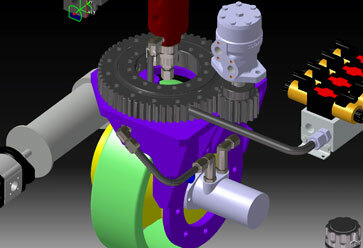 Equipment Design utilizing state of the art 3D Parametric software. We offer the following engineering services for the industrial and manufacturing community; Mechanical, Electrical, Pneumatic and Hydraulic. Our staff has worked with some of the largest companies in North America, designing and building custom equipment. 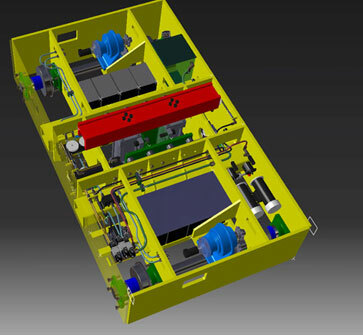 We offer complete integration of designs into one turnkey product with full two-dimensional and three-dimensional capabilities. Designed to specifications, or complete project engineering services. Consultation services and engineering studies related to Fluid Power, Electrical and Mechanical Systems. Field of Expertise: Applications Engineering involving the specification, solution proposal and quote generation for a wide variety of machines, material handling equipment, manufacturing solutions and systems. Mark has over 20 years of experience evaluating, specifying and proposing effective solutions for Heavy Equipment, Automotive and Aerospace customers. Background: Digital Illustration, Digital Painting, Photo Manipulation, Photo Restoration, 3D Mechanical Illustration, and Corporate Imaging. Field of Expertise: 3D Conceptual Mechanical Design of Complex Equipment, Graphic Design, Video Editing, Photo Manipulation and Digital Illustration. Background: Mechanical Equipment Design, Fabrication and Project Management. Engineering Projects including Custom Material Handling, Bulk Material Handling, Lifting Devices, End Effector, and Manipulators. Field of Expertise: Mechanical Design for Lifting Device and End Effector design, utilizing sound engineering principles to achieve simplistic, effective and efficient tooling designs for industry second to none. Field of Expertise: Custom Material Handling Equipment, Incorporating Air Bearings, Wheels, Pneumatic and Hydraulic Lifts, Conveyors, Pneumatic and Electric Drives. Background: Mechanical Equipment Design, Fabrication and Project Management. Engineering Projects including Custom Material Handling, Complex Mechanical Design of Solution Based Equipment for a wide variety of large fortune 500 manufacturers. Field of Expertise: Mechanical Design of Complex Mechanical Equipment, Machines and Systems, Custom Tooling, Lift Device, Pneumatic and Hydraulic Systems. Duffy is a Custom Equipment Engineering Expert with a long list of satisfied customers. Field of Expertise: Joe has been designing material handling equipment, heavy load movement equipment and tooling since 1989. Prior to that he was a Processing Engineer and CNC programmer. Joe worked for 16 years as a Designer / Project Engineer for a leading air film technology company specializing in heavy load movement. He has been involved in many projects for Aerospace, Automotive and Heavy Equipment customers. He has worked for Aura Systems a total of 7 years and specializes in the design of custom conveyance systems and custom ancillary equipment. Field of Expertise: Control System Engineering and Design. Allen Bradley/Rockwell PLC & HMI programming. Siemens PLC & HMI programming. Toyopuc PLC & HMI programming. Mitsubishi PLC & HMI programming.